← David Huff: Diamond in the Rough? Aaron Judge, the Yankees’ 32nd overall pick from last year’s draft, is having an excellent season at the plate. Through 97 games between two levels of A-ball, the 22-year-old Fresno State product is hitting .320 with 13 dingers. Based on his 6’7” frame, many scouts peg Judge to be a perennial 40 home run threat down the road as long as he’s able to make consistent contact. That seems to be a common narrative for tall hitters. They have plenty of physical strength, but their long arms can lead to long swings, making it difficult to get around on inside pitches. Up to this point, making contact hasn’t been much of an issue for Judge, who’s struck out a manageable 22%. Keith Law recently noted that Judge has “a surprisingly short path to the ball for a guy his size.” That sounds encouraging enough, but the “for his size” piece might be something worth worrying about. After all, very few players in Major League history have stood as tall as Judge. Of the 8,559 position players who have played in the majors since 1901, just 11 have matched or eclipsed Judge’s height, and just 113 more reached the 6’5″ mark. Today, there are 313 active players (of all sizes) with at least 500 big league plate appearances who also logged at least 300 between low- and high-A, a threshold that Judge passed last month. Unsurprisingly, the taller players in this group tended to have higher strikeout rates. But the more interesting story is what happened as these players ascended to the big leagues: their strikeout rates rose more swiftly than their non-giant counterparts. This discrepancy among players of varying heights is large enough to be statistically significant. 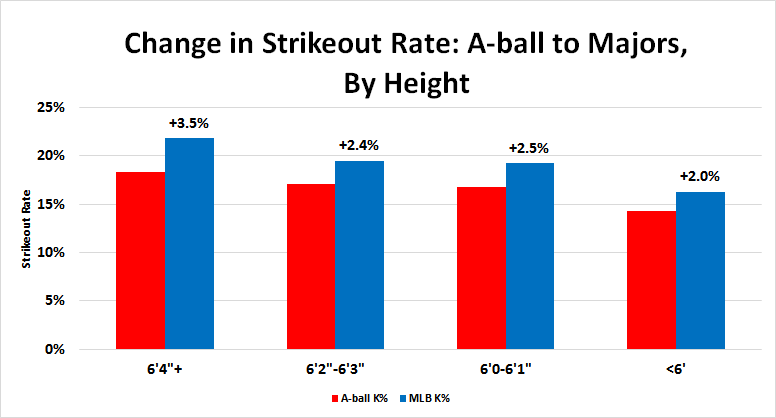 The results of a multivariable linear regression show that, even after adjusting for a player’s A-ball rate, every inch in height correlates to 0.4% increase in strikeout rate between A-ball and the majors. So all else being equal, Judge’s K% can be expected to be 3% higher than a 5’11” player with the same minor league rate. Plugging Judge’s 79 inches and 22% strikeout rate into this model, we get an expected big league strikeout rate of 25.4%. That’s nearly 6% above the league average, but still not terribly high. Another tall power hitter by the name of Giancarlo Stanton has turned out just fine despite striking out 28% of the time in over his career. There’s a reason Aaron Judge is such a highly-regarded prospect. Not only does he have tremendous power, but he also reportedly runs very well for his size, making him a non-zero defensively and on the base paths. That sounds a lot like Stanton or Jayson Werth, who happen to be a couple of the better and more exciting players in the game today. Judge’s upside is clear, but all of the power in the world won’t do him much good if he can’t put the ball in play at a decent clip. And although Judge has fared extremely well so far, his height puts him at risk of developing a swing-and-miss problem. This doesn’t bode particularly well for him continuing to hit for a high average, but hopefully won’t stop him from being a perennial 30+ homer threat for the Yankees down the road. Statistics courtesy of Fangraphs and The Baseball Cube. This entry was posted in Analysis, Prospects and tagged Aaron Judge. Bookmark the permalink. 2 Responses to Does Aaron Judge’s height put him at risk for striking out too much? Great analysis, & I like the chart. The catch is selection bias: among players in Judge’s height group, K rate rises 3.5% — among those who make it to MLB. It’d be a lot higher if you include big guys who wash out in AAA after their K rate rises above, say, 30% (like Kyle Roller, who isn’t that tall but quite possibly will never make MLB because his K rate from A-AA-AAA went 24%, 27%, 30%). I’m not disagreeing with your finding, just noting that “K rate up only 3.5%” is the good-case scenario in which Judge matches the big guys who made MLB. Which is to say that it’s at least plausible a big guy can avoid having his K rate skyrocket. Good point. The 3.5% is almost certainly a tad bullish once you consider selection bias. But the difference between tall and short players (0.4% for every inch) is probably about right. The selection bias wouldn’t only apply to tall players, but to short ones as well. Players of all sizes never make it to the bigs, and would have relatively high K rates if they had been given 500 PA’s for some reason. Thanks for reading!